In those places where moms and strollers rule, he is sometimes seen as strange, even dangerous. But when you hurry your children out of his way, you are sending a message to him and to all of our children that all men can not be trusted. Yes, clearly you were surprised to see a man. A man at the play center. And he wasn’t on his iPad. He was actually playing. With his children. Perhaps you couldn’t see that the reason he was crawling through that tunnel with all the kids was because he was trying to retrieve our runaway son who had become lost inside the jungle gym. I hope that’s why when he emerged, you glared at him and dashed into the play area to usher your kids away. You know what? You made him feel like he was doing something wrong. Which he wasn’t. And that time he sat down next to you and your child at the movies and you didn’t realize that our daughter was right behind him? You didn’t really need to make a big deal about moving your kid a few seats away. You really didn’t. I know. I know that some men do unspeakable things to children. I know that if any of those things have ever happened in your world, it is not something you can ever, ever, push out of your mind, or stop being vigilant about. And I know that a little offense taken by a grown man, on the scale of the horrendous things that happen to little kids every day, is not A Big Deal. 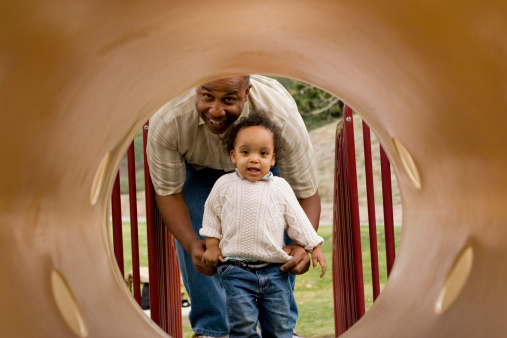 But here’s a thing that is A Big Deal—we need dads to be involved with their kids. And we need to see them doing it. We need to see good fathers. Good role models. We need to hold them up and show that in the tsunami of stories about child abuse, sexual assault, family violence, and deadbeat dads, there are good men. Lots and lots of good men. We need to see them being physical and affectionate and hands-on with their children. We need to see that they are perfectly capable of looking after kids and home and being part of an equal partnership and a loving relationship. We need to see that they can be helpful and mindful of the safety of kids around them, even if they’re not their own. Yes, that guy who put his hands on another person’s child in a playground recently was out of line. But the stories it spurred about men feeling judged and uncomfortable in children’s public spaces made me sad. And a little bit angry. He is what you’d call a “hands-on dad.” There are lots of them. He has a day at home with our two little kids every week, and just like any sane human being, he knows that being under house-arrest with preschoolers is a legal form of torture. And so he’s the King of the Daytrip. Playgroup. The library. The zoo. The duck pond. The park. The beach. Yes, the indoor play center. Swimming class, complete with change-room drama. And out in the world, in those places where moms and strollers rule, he is sometimes seen as strange, unwelcome, even dangerous. He gets it. And he ignores it. But when you hurry your children out of his way, you are sending a message to him and to all of our children that men, all men, can not be trusted. That there is something suspicious and strange about a man who chooses to spend time with his children and around other children. But some men love children. Even that sentence is uncomfortable to type. Before we had kids, he would always be the one rumbling with the big kids at barbecues and family parties. The one who wanted to cuddle the newborn on the first home visit. Since I gave birth to our daughter almost five years ago, I have watched him grow and change in a way I never imagined. He is completely comfortable in his role. He is a natural father. A person who gets genuine joy from spending time with our children, from playing with them, from comforting them, from teaching them stuff, and yes, even from feeding and clothing them. And our children adore him. When they wake up scared or sick in the middle of the night, he and I are entirely interchangable. The cry goes out, “MommyDaddy, MommyDaddy, MommyDaddy!” We share the role of their safe place. In 2014, involved, adored dads like my partner are not unusual. So why are these dads still treated as freak shows? The fact that child sexual abuse is no longer a dirty, silent secret but something that we are all aware of is a great leap forward in keeping our kids safe. But pushing men out of public parenting spaces will not help anyone. Who wants to live in a world where Dad can’t take the kids to the shops because people will be uncomfortable if he takes them into the Parents’ room when they need the toilet? And how is it helpful if only Mom is welcome at playgroup, kids’ swimming, and ballet? Surely the eyes of many, vigilant men keep our children safer? And surely kids seeing examples of compassionate, loving men all around them gives them something to aspire to? More choices of what their own families, their own partners, their own lives could look like? And also, there’s this: It’s a beautiful sight to see a happy dad playing with his kids. It’s not something that should only happen behind closed doors. Holly Wainwright is a contributor to Mamamia.com.